Safely clean just about any surface inside your vehicle! Britemax Interior Cleaner is a versatile interior cleaning formula suitable for use on virtually any surface inside your vehicle. This safe, gentle, and effective formula eliminates grease and grime without damaging the surface—it’s even safe on upholstery! Britemax Interior Cleaner streamlines the interior cleaning process saving you time and money! Britemax Interior Cleaner Multi-Surface Cleaner safely cleans just about any interior surface of dust and debris! There are scores of products for the exterior of your vehicle—from buckets and brushes to multi-step correction products, and let’s not forget coatings! You probably have your favorites, too, but what about the interior? Interior detailing can be tricky. While there are a lot of products available, many of them are perfect for one section of the interior, but completely unsuitable for adjacent areas, making interior detailing stressful. Britemax Interior Cleaner simplifies the process with a versatile formula that can be used throughout your vehicle’s interior. Britemax Interior Cleaner is safe to use on vinyl, rubber, leather, upholstery, carpeting, and virtually any other surface you can think of in your vehicle! Powerful cleansers in the formula go to work on grease, body oils, food spills, pet stains, and other messes without causing any damage to the surface. Britemax Interior Cleaner never leaves any residue behind and can be used as often as necessary! 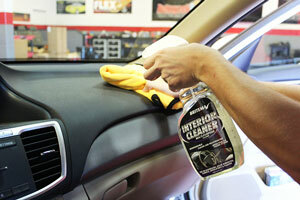 Clean up your interior the easy way with Britemax Interior Cleaner. Always test new cleaners on an inconspicuous area prior to full application. Britemax Interior Cleaner Multi-Surface Cleaner 128 oz.